Daryl Mitchell carried on his crusade against Hampshire as Worcestershire recovered from an early crisis in the New Road clash between the bottom two teams in Division One. Mitchell's timely 105 not out - initially moulded in a partnership of 142 with teenager Joe Clarke - saw the home side through to 228 for 5 after losing three wickets in 12 balls from Jackson Bird on a first day shortened by rain before lunch and bad light in the afternoon. From the 2011 season, Mitchell has reached 50 six times in 10 championship innings against Hampshire for an aggregate of 706 at an average of 117 after hundreds in three of the last four meetings. For Clarke, everything is a different experience, a 19-year-old playing in only his fifth Championship match and impressively building on the 50 he made on his home debut against Warwickshire three weeks ago. A new personal-best score of 70 from 136 balls was a bold and fearless response to a dire situation when Bird was promising to lift Hampshire out of their worst run in eight years. After five consecutive defeats, two of these in the Championship, losing the toss was perhaps not the worst thing that could have happened. For an hour or two, bowling first was the most acceptable option. From his high action, Bird got the ball to dart around with some bounce, although it was a delivery of fuller length that accounted for Richard Oliver in the third over. In a comedown from match-winning unbeaten T20 half-century on Sunday, the left hander was leg-before for 3. In his next two overs Bird got further wickets in different ways, with Tom Fell fencing a low chance to wicketkeeper Adam Wheater and Tom Kohler-Cadmore taking his bat away from a ball which cut back to take the off stump. At 25 for 3, Worcestershire wriggled clear of trouble as Mitchell rode his luck in a testing examination by Bird and Gareth Berg, but Hampshire were unable to maintain the pressure. After four years as captain, Mitchell has matured into a well-rounded cricketer with a capacity to shut out moments of uncertainty and focus on what comes next. This served him well with as many as 10 fours in a brisk 50, but when Clarke began to push on, Mitchell slipped into a more conservative role, adding only four boundaries before completing his century from 213 balls. Clarke nudged a catch to short leg off Danny Briggs after hitting 10 fours but the mixture of youth and experience continued with Brett D'Oliveira making 19 out of 49 before he was taken at second slip off the lively Brad Wheal. Hampshire's first team coach, Dale Benkenstin added: "It was a solid day but at 25 for three there was a real opportunity and we got a little bit excited. We have not had those opportunities, especially recently. It's fairly good, slow, placid wicket. I think we almost tried to get wickets but they got a bit away from us. If you bowl in good areas there is enough in the wicket and it's hard to score." 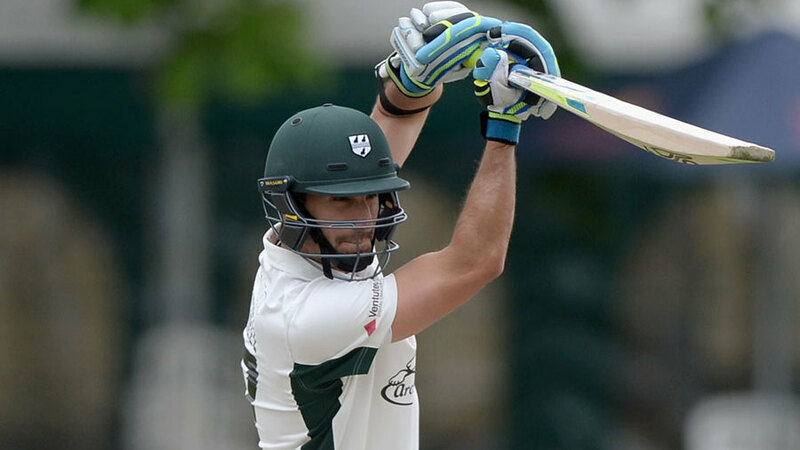 "It's always pleasing to get a hundred and when we were 25 for three it's doubly pleasing to get us out of a bit of trouble," Worcestershire century-maker Daryl Mitchell said. "We will see how important it is at the end of the game. It's a good wicket, pretty dry and not a lot of grass, and I thought batting first was important with two spinners in the team. There was a bit of cloud cover and it did nibble around a little but with the new ball but we overcame that, myself and particularly Joe Clarke. I thought he played a fantastic innings."